Last year I wrote about stuff I carry in my laptop bag. Nothing original, definitely a tendency to carry things just in case I need it. The bag was a Maxpedition, solid, not small. For the past few months I’ve been using a backpack and its worked out ok, the vertical orientation seems like it is easier to manage in crowded spaces like airline aisles and elevators. Still plenty of junk for the extra stuff I often carry. 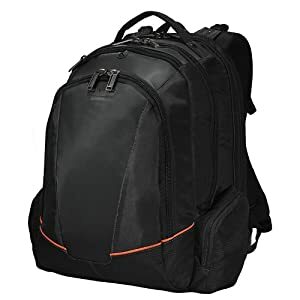 I’ve ordered a new laptop and while I wait for it to ship I decided to order a new bag to go with it, this time trying a Everki Flight Checkpoint Friendly backpack. Received today and quality seems good, I just hate that kind of small change. I’m using to stuff being in a particular place, now I have to find that new place for everything. The only thing I see so far that I’m not sure about is the external pocket that can hold a water bottle. I think a simpler pocket decided to water might have worked out better. No shortage of space for geek stuff inside. I’ve also been thinking to downsize for when I’m really carrying a bag all day. I’ll still want the new laptop (3 pounds plus power adapter), but not much else – maybe a pen and really small pad of paper, business cards, that’s about it. I debated using my old military map bag,but it doesn’t have any padding in the bag or the shoulder strap,and not much in the way of pockets for business cards even. I ordered an STB Vertical Bag, closer to a messenger bag format. Definitely seems lighter than the backpack. Still plenty of storage, maybe even too much. Not sure it needs that top flap, there is one under it that covers the laptop. I figure I can pack all but the laptop in the event bag and leave it ready to go, drop the laptop in and go. I don’t do enough presenting to merit a dedicated laptop for it! Given that it will be on my shoulder all day it will be nice to have it small and light. As I looked for these two it was interesting, even amazing, to see the variety of bags – this Tom Bihn bag for example looked very solid. I saw some in canvas, even waxed canvas, the old reliable. Still tempted to make my own custom Batpack – a place for only the things I need – seems like fun, if far more work than ordering one. Anyone out there have a dedicated event bag? Or a new and interesting laptop bag? Good find on that STM Vertical laptop bag. Looks comfortable. Let me know how you like it. I”m getting tired of dragging around my old Coach leather monster.